Eight students have successfully completed The John A. Burns School of Medicine’s ʻImi Hoʻōla Post-Baccalaureate Program, meaning they will begin medical school at the University of Hawai’i’s medical campus this July. 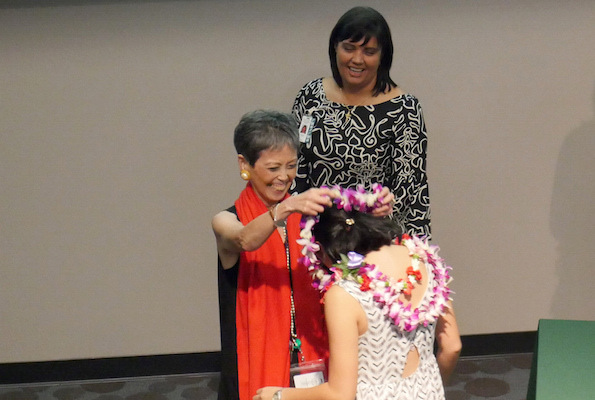 ʻImi Hoʻōla allows students from historically disadvantaged backgrounds to enter medical school. Each student has made a commitment to serve needy communities. So far, ʻImi Hoʻōla has 194 students who have graduated from medical school and are now in residency training in Hawai’i, Guam, Pohnpei, Republic of Palau, Commonwealth of the Northern Mariana Islands, American Samoa and the U.S. mainland. The 2007-2008 ʻImi Hoʻōla Class includes Clyner Antalan, Bianca Chun, Nikki Chong, Kanoe-lehua de Silva, Tui Lauilefue, Kit Shan Lee, Seabrook Mow and Leah Wang. Dr. Gerard Akaka, Vice President, Medical Affairs at at the Queen’s Medical Center, and an ʻImi Hoʻōla graduate, spoke to the students in a ceremony June 6, 2008 at the John A. Burns School of Medicine’s Kaka’ako campus.